Looking for a Logo for my new venture. I am opening a physical location for Printing and Marketing Services. I will need a logo that I can use on Dark and Light mediums as well as something I can use as a sign for my Store Front. Unfortunately it can&#039;t be something that would be hard to fabricate into a sign. Attached find a sample of what I am looking for in terms of deliverables. The logo should appeal to Small Business and common people. It should convey, trust, strong, and friendly. 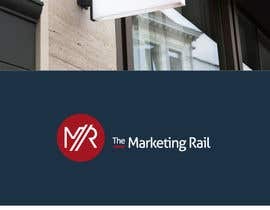 The Marketing Rail is set to become the household name for Small Business Marketing. There are a lot of &quot;firms&quot; out there that just don&#039;t get it. It&#039;s all about return on investment for Small Businesses, they don&#039;t care about Cost Per Click and how many Impressions an ad generates. We get it. How are we doing it differently? We asked ourselves what is the best way to align ourselves with Small Business? Well, it&#039;s to be a Small Business. We are servicing small businesses right from their own town! We are not trying to over reach a small office in a small town somewhere to service clients in different states. We are local, we are here, and we aren&#039;t going anywhere. That&#039;s all great, but what are you exactly going to do for me as a Small Business owner? Here is a list of things you would need if you were to start a business right now and we provide them all. 	You get the point. Do you know how many times I’ve heard this? You’re right, there are a lot of peddlers out there – how about a 100% money back guaranteed? If you don’t generate any leads from any of our marketing services, you can request a 100% of what you paid to be returned and we will do so! Ok, so your saying that all I would ever need is The Marketing Rail and I would never have to deal with another company for my marketing needs? You said it, not us! Dealing with a different graphic designer vs your web guy can get hard. One is unresponsive and the other one didn’t care enough to give you everything you needed just in case they went MIA. You don’t have to worry with us, we will always be there, we are not a single man show. We can’t hide even if we wanted to, we have a store front! That’s how serious we are.